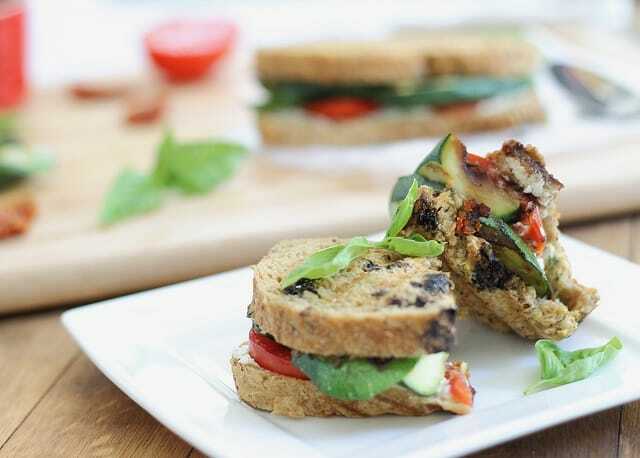 This grilled zucchini goat cheese pesto panini is drizzled with a balsamic reduction. It’s got all the flavors of Italy in a quick lunch. …with a balsamic reduction. Sorry, couldn’t leave that part out but the title was getting a bit ridic. I hate when recipe (granted this is a panini and it feels weird to call it a “recipe”) titles pretty much list out every ingredient in them but if I called this a “grilled zucchini panini” would you want to read on? Eh, probably not. Throw the words goat cheese, pesto and balsamic reduction in there though and I go all Pavlov and start salivating upon just reading so I’m hoping you do too and the long title is worth it. I want to talk about how insanely delicious this combination of tart goat cheese and sun dried tomato basil pesto is with perfect summer squash and tomatoes but really, I just booked flights and hotels to Italy for September and I can’t focus. Can we please just fast forward 9 weeks instead to when my schedule for the next 13 days will look like wine, gelato, pasta, gelato, Italian men, gelato, seeing family who I can’t communicate with and oh, gelato? I guess this post is kind of appropriate considering it’s pretty “Italian” flavored (and colored!) but as delicious as this sandwich was the other day, I guarantee the basil, tomatoes and zucchini are going to taste 10 thousand times better in Italy. Cannot.wait. Have you ever reduced balsamic vinegar? If not, you are seriously missing out. I have a love affair with the stuff that dates back to childhood dinners and me drinking the salad bowl to finish all of the vinegar at the bottom. I don’t know how it’s possible for vinegar to be sweet and yet so tart at the same time but somehow balsamic accomplishes that. Reduce it to a thick, syrupy glaze and it just gets better. Combine it with creamy goat cheese, roasted vegetables and a fresh made pesto, omg I’ve died and gone to Italy this is my idea of heaven. As long as there’s gelato there too for dessert. 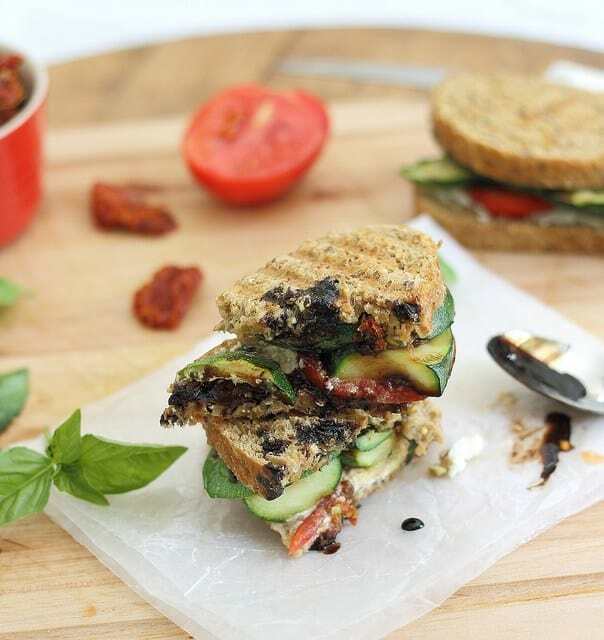 This grilled zucchini goat cheese pesto panini is drizzled with a balsamic reduction. It's got all the flavors of Italy in a quick lunch. Combine sun dried tomatoes, garlic, basil, avocado, olive oil and salt & pepper in a food processor and pulse until combined. Heat a grill pan or outdoor grill to medium high. Spray with cooking spray and layer zucchini slices on. Grill for 3-4 minutes per side depending how thick the slices. You want them cooked through with grill marks but still retaining a slight bite to them. Remove zucchini and set aside. Spread goat cheese on one piece of bread for each sandwich. Spread pesto on the other piece of bread for each sandwich. 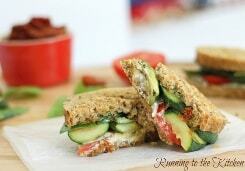 Layer zucchini and tomatoes on top of one slice of bread and cover with the remaining slice. Place sandwiches on a heated panini press and cook/press for about 5 minutes until goat cheese starts to melt. While panini cooks, heat a small sauce pan with balsamic vinegar to medium. Simmer and cook until reduced and vinegar becomes thick and syrup-like. It should just start sticking to a spoon when ready. Remove panini from press and drizzle balsamic reduction on top or use as a dip in a small side bowl. I’ve got an extra zucchini laying around begging to be used. This is perfect! I definitely salivated.. you had me at goat cheese. This sandwich has all my fave things in it! Balsamic reduction + goat cheese is always a killer combination – I’m thinking caramelized onions would be great here, too! AHHHH a trip to Italy! SO fun, it’s amazing there. Awesome combination of flavours, it just looks like it’s bursting with summer goodness! 2) Goat cheese, tomatoes and reduced balsamic vinegar would be my earth, wind and water if that were physically possible. Delicious! I was sold at goat cheese…. absolutely hands down my FAVORITE cheese. Love it combined w/ pesto as well. you’re going to italy?! Amazing!! For business or pleasure? Ugh! Sometimes I hate naming recipes because I feel like it is a hard balance between being too descriptive and too elusive. I think you did an excellent job with this guy! Looks fantastic! I am sold on anything with goat cheese! Yum! Italy would be my #1 choice for someplace to go in Europe. How cool that you have relatives there. I probably do too somewhere given that I am formerly a Ruvolo. maybe I should look into that. :) You will be Italy-ing while I am moving to the desert. You win. :) lol. And I briefly saw something about that on my phone since I haven’t read blogs in 3 days having been away for work…now I have to go read all about this move of yours! I didn’t realize that’s all you had to do to make a Balsamic Reduction! I thought other ingredients were added in order to thicken it. Have you ever tried Aged Balsamic? It sounds similar to a reduction, it’s thick and sweet. SO GOOD! I loooove aged balsamic! My brother got me an aged fig balsamic for Christmas and I just about died. Would it be totally obscene to buy a panini press just so I could make this sandwich? “Zucchini panini”…I kinda love the ring of that! Either way, this sounds delicious – I love grilled veggies just about any way! I made this today and it was absolutely delicious! I am going to eat it again tomorrow it was so good. The only thing I changed was using ricotta cheese in place of the goat cheese since I don’t care for it. What’s the bread in this panini? It looks amazing, and perfect for it. I’m honestly trying to remember what I put it on in this picture since it was months ago…I think it was just regular wheat bread! It must be the pretty picture with the balsamic reduction that makes it look so good. I thought maybe there were some extra grains and some reddish tomatoey content to it. I might not be able to wait until these ingredients are seasonal again to try one of these. I’m going to eat this every day. For the rest of my life.